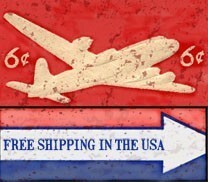 There are 3 pieces all different and sold individually. Normally, I'd just throw them (gently, of course) into a lot but sometimes all ya want is a little dab of scrap trim to slap on dress up a project. See description for intimate details. Birds of a feather.....end up as trim for flighty decorators. As usual I have them because they are just so cool and was thinkin' maybe a lampshade could benefit from some feather fringe. 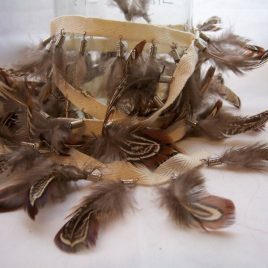 There are 3 different types of feathers and all are attached to the twill tape with springy thingies. Sold by the piece and each piece is approximately 1-1/2 yards. 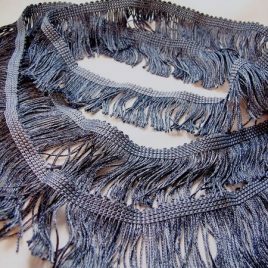 Fringe is one of those trims that never goes out of style and chainette fringe is a staple in home decor. Here we have 2-1/4 yards of denim blue. The fringe is 2" wide. 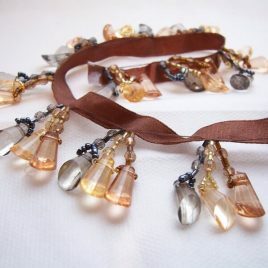 Three shades of brown in the beaded fringe work well with many neutral decorating schemes. 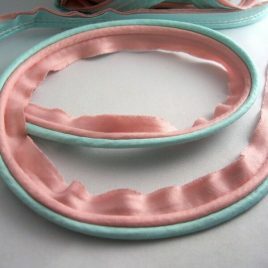 You'll get 1 piece, 3 yards in length. Stunning! 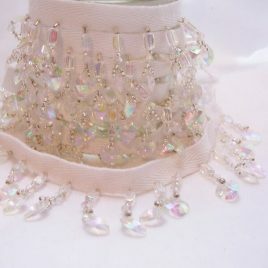 So many uses for beaded fringe - lampshades, pillows, trimming out a window valance. 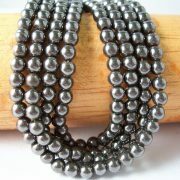 Normally I'm not attracted to shiny objects but beaded fringe is the exception. You'll get one piece - 2 yards in length. Stunning! 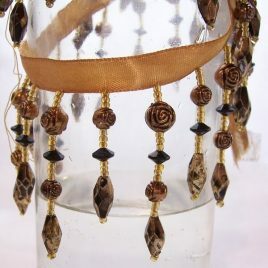 So many uses for beaded fringe - lampshades, pillows, trimming out a window valance. 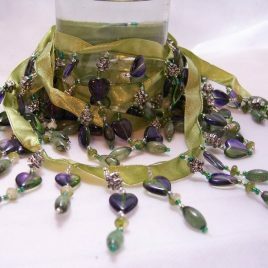 This color combo of green and purple looks like spring garden to me. 1 piece 1-3/4 yards in length. For being not leather these handbag handles are pretty nice. There are 11 in all, five are wrapped individually and the other 6 are in pairs. Note the widths and colors in the description. 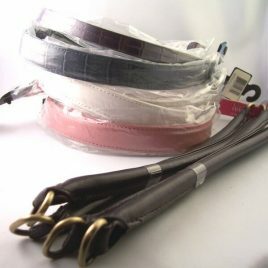 Lots of uses for suede lace in genuine leather. 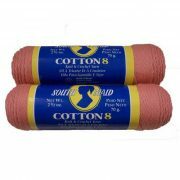 You'd get 3 spools 1/8" x 25 yds and 2 small packages of the pink. There was probably a time when these were hanging on a wall in a craft shop in a land that wasn't filled with big box stores. I was much younger then and was considered quite fair if not the fairest of them all! 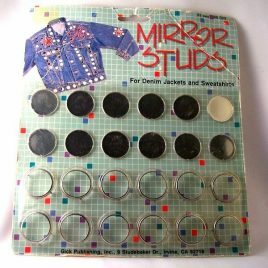 Note the package says "mirror studs" ha ha!! There are 12 in that package and some nifty pronged rings if you're not using them Shishi style and there are 15 circles in the flex-o-mirror package. 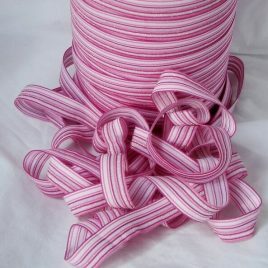 Pink fold over elastic (FOE) with a multicolor stripe and a touch of sparkle. 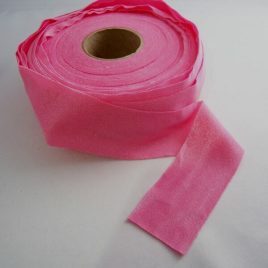 5/8" wide and you will receive 5 yards in this lot.